And it might be worse than it currently appears. 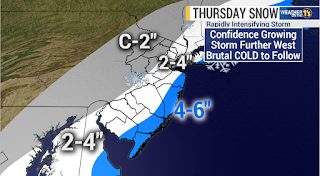 This is the amount of snow forecast for New Jersey on Thursday, courtesy of News 12 New Jersey. This snow is due to a big, powerful, significant, massive storm - described with all of the adjectives you never want to hear in any weather forecast - and even though my area is in the two- to four-inch range (in fact, I'm in the edge between a coating to two inches and two to four inches) and there's no winter storm watch for my county as of yet, those numbers could increase and there could be a storm alert for my county if the storm continues to turned west as it has been doing. (As anyone who's ever seen Kanye pop up on hot topics online can attest, "trending" and "west" are two words you never want to hear together.) 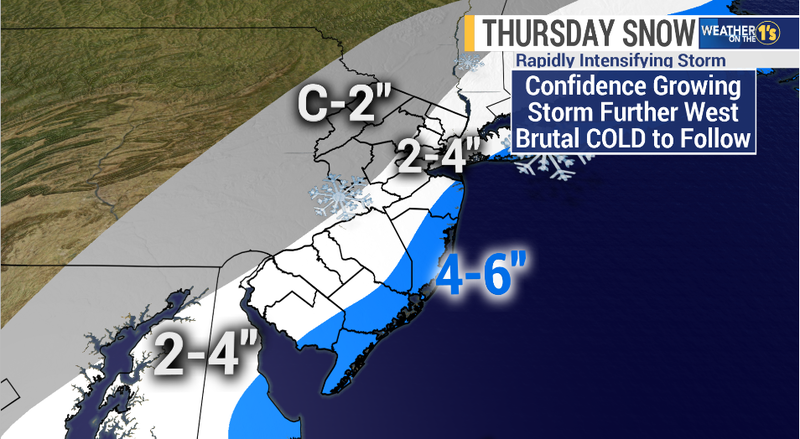 This storm will include high winds, the most severe of which will be at the shoreline. Then, after the storm, comes the worst cold of this winter so far - single-digit highs and sub-zero lows! The good news? It'll warm up into the forties by next Monday. (Remember, all temperatures are Fahrenheit.) Since I likely won't get the worst winds or the worst snow, I think my electricity should be alright. My pipes, on the other hand . . .
Ima let you thaw, but . . .